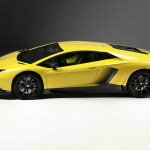 We knew that we were due for an anniversary car from Lamborghini. Founded in 1963, this is the 50th Anniversary of the brand and we have celebrated several milestones in production. The 1988/9 25th Anniversary Countach was first, the 1993/4 30th Anniversary Diablo SE came next, and in 2003 we had the Verde Artemis Murcielago 40th Anniversary. 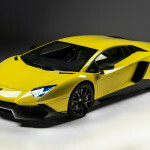 In Shanghai Lamborghini recently unveiled the 50th Anniversary car – a gorgeous yellow Aventador. There will be a limited run of 100, numbered cars split evenly between coupes and roadsters. 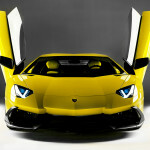 The car is shown here in Giallo Maggio but is available in the customer’s choice of color.